Which Retractable Awning Is Better: Manual or Motorized? 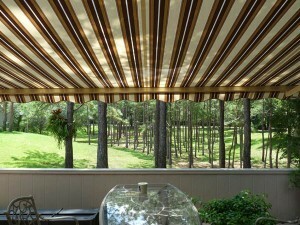 Both manual and motorized retractable awnings have their own pros and cons. Learn more below! There are two types of commonly-used retractable awnings currently on the market, manual and motorized. While both are cost-effective ways to make your home more energy efficient and love spending time outdoors, there are pros and cons to choosing either one. How can you make the right choice between a manual retractable awning or motorized retractable awning? Manual retractable awnings use your manpower and muscle to take them down. To put your awning up or take it down, you will need to turn a handle to get the job done. They don’t require much effort to open and close, so they can be used by anyone from children to seniors. Manual retractable awnings will also be operable in the event of a power outage, unlike motorized awnings. You also won’t need to worry about the minor problems that can occur as a motorized awning starts to die, like battery problems or parts that are worn out. Manual retractable awnings are much easier to purchase and install, and their price is often hundreds of dollars lower than a motorized awning. Since there isn’t any need to deal with complicated electrical wiring, you will save on both parts and labor. A motorized retractable awning is the easiest way to get the shade that you want in the press of a button. Motorized awnings take less time to open up, so they are popular for homeowners who are interested in aging in place or who might have trouble with arthritis or moving their hands. Research studies have also shown that motorized retractable awnings get much more use than other types of awnings thanks to how easy it is. Motorized awnings can be used over 5 times as much than their manual awning counterparts. Additionally, motorized awnings have a cleaner and sleeker look that many homeowners find more visually appealing. Concerned about leaving your awning up for long periods of time? Your awning can be built with sensors that will detect heavy winds and automatically put the awning down when there’s a chance it will be damaged.